Remarks about the tides in east peninsular Malaysia. The first time I was in Malaysia (Perhentian Islands) I had the strange impression the tide was random; some days there was two tides per day some others only one. Anyway, even the days we had two cycles, the low waters seems lower at night than during the day. It's really different from what we have on the atlantic coast in Europe where the cycle is roughly of twelve hours and the hours of high and low tides moving from a day to an other. For example if it's high tide at noon on one day, a week later it will be low tide at the same hour. An other thing you can notice on the two graphs is that the levels of the high and low tides are almost the same during a day. On July 1st the level of high water is at 9,94 m at 11am and it's 9,61m at 11pm. In Malaysia, it seems it's always low water at night and high water during the day. Looking at the next graph, you can notice that as in France there is a cycle of 12 hours but the low water at night is much lower than the low water which occurs during the day. To confirm this notion, we can have a look at the following graphs. On the first one: the high and low waters during two months in Saint-Malo (France). There is no significative difference between the levels of the morning and the evening waters wether it's high or low. On the contrary, in Singapore the low water in the morning is lower than the one in the afternoon. This doesn't explain that some days it seems there was only one tide in Perhentian. 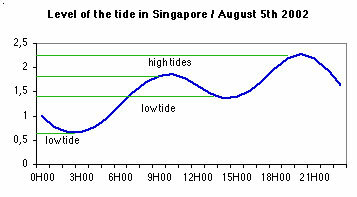 Unfortunately I have no data for tides there but it seems more complex than in Singapore. h 3  An other mixed type with a diurnal dominant is when you've got some days two cycles and some other days one cycle. It's the case in Bangkok. The explanation of such differences is far beyond my competence ! You can find a distribution of the four types in the world on three maps : Atlantic and Mediterranean Sea, Indian Ocean and Oceania and Pacific . The color code is the same as the one used above. h What's going on in Perhentian ? Although I haven't got any data about the tides in Perhentian, it seems from my observation that the two islands are in the yellow area. That's to say: sometimes one tide a day, sometimes two and in this case the two lower waters of a same day are very different. This is confirmed by the map found in The Malaysian sea level monitoring network, Teh Seng Hoe, Gloss report, 1996. Whatever happens, this tidal regime is really important for molluscs. It means there is no very low water during the day when the sun is so strong. For the amateur conchologist, it means, he will have to get up very early if he wants to catch the low tide (often at night !!!) and that snorkeling in the early morning, at sunrise, between the beach and the coral barrier is impossible. On the contrary, to collect dead shells on the beach, late afternoon is perfect (but now strictly forbidden) ! Thanks to Henry, in 2003, I was able to find the shop where tide charts were sold in the suburbs of KL. It was July, piles of charts were still there but they were all already sold... Fortunately, the guy in charge was kind enough to make copies of some pages. For the next years, we were advised that the charts will only be sold by the Marine, that is to say almost impossible to get. So you should try to ask a diving shop. Chendering, Geting, Kertih Terminal, Kuala Dungun, Kuala Rompin, Kuantan, Mersing, Pahang, Paka, Penawar, Pulau Babi Besar, Pulau Varella, Setiu, Sungai Besut, Sungai Kemaman, Tanjung Berhala, Tanjung Gelang, Tanjung Penawar, Tanjung Sedili, Tanjung Sedili Kechil,	Teluk Tekek, Terengganu, Tumpat.